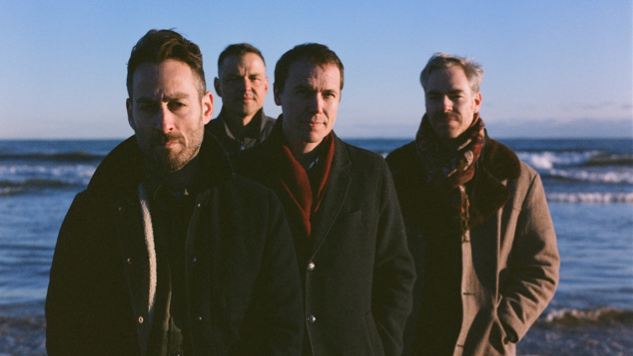 Iconic emo band American Football have released a new single, “Uncomfortably Numb,” ahead of their forthcoming third album, American Football (LP3). This newest track features accompanying vocals from Hayley Williams of Paramore, who pops up on the impending album’s tracklist alongside Slowdive’s Rachel Goswell and Land of Talk’s Elizabeth Powell. LP3, due out March 22 via Polyvinyl, is the band’s second release since their 2014 reunion, and offers a contrast from their previous records. Notably, the album will not feature cover photography of the Urbana, Ill., home that has appeared on the band’s previous album covers so famously as to spark fan pilgrimages and photo ops. Rather, the band has opted for imagery (still by photographer Chris Strong) of Urbana’s misty hillsides. This conscious visual break signals American Football’s move in a bolder, more unfamiliar direction. Released alongside the new single are tour dates—including a hometown release show in Chicago—and a video (dir. Atiba Jefferson) featuring cameos from actor/comedian Blake Anderson, professional skateboarder Paul Rodriguez and Samhain drummer London May. VIP album preorder bundles are available now, while tour pre-sales are set to go live this Thursday, Jan. 24, at 10 a.m. ET. Listen to “Uncomfortably Numb” below, and revisit previous single “Silhouettes” and the details of American Football (LP3) here.